Roman urinal partitions ... privacy ensured. Leading international shower designer and manufacturer Roman has launched urinal partitions for the projects market in 10- and 12-mm-thick, toughened safety glass. The standard products come with an all-over etch finish for privacy. They feature stylish wall brackets, which can be chosen in polished or brushed stainless steel finish. The partitions carry a lifetime guarantee as do all Roman products. The glass finish can be frosted or printed glass, using Roman’s digitally printed glass technology. This is an exclusive technology to Roman built in collaboration with digital print specialist Dimax, according to a company spokesperson. Decem Expressions, as it is known, presents a significant innovation in digital glass printing on wetroom panels. 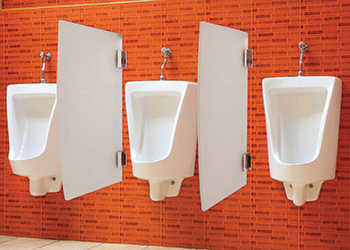 The urinal partitions can be sized to the exact project specification and requirements. Roman can design partitions to match any requirement and also utilise solid surface sheet if required in place of glass. “Roman’s Decem Expressions lends itself perfectly for the project market. Designers can now easily link up other design themes through a project directly onto a larger and visible position within the bathroom via the glass and there are no restrictions on colour or resolution,” says the spokesman. All Roman products are designed and created in Britain, offering top quality, precision and craftsmanship. 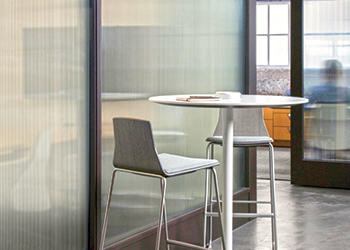 Created by the Coalesse Design Group and Lievore Altherr Molina, the collection is a refined addition to the casual meeting setting. Classically designed, the Montara650 collection’s sculpted chairs, stools, and lounge chairs are paired with simple pedestal tables. “Until now, offices in the UAE have been primarily traditional in their layouts, although more and more we are witnessing the emergence of dynamic, flexible and adaptable offices which cater to the changing needs of an increasingly mobile workforce,” says Andy Morris, head of sales, Steelcase Middle East. “We’ve found there is a direct correlation between engagement and workplace satisfaction, and the Montara650 collection is helping to bridge the gap by encouraging work environments that are highly functional yet inspire creativity, engagement and collaboration for best thinking amongst employees,” he adds. Montara650 fills informal spaces with a café-style character and provides members of the architecture and design community with a highly customisable set of design options. The durable, oak-veneered plywood shell of the collection’s stackable chairs is available in five subtle stains and can be upholstered fully or in a unique, three-quarter style that enhances comfort while maintaining the warmth of the wood. The seating is available with four legs or a sled base, with arms or armless, in trivalent chrome or painted to match the office palette. Inspiring living rooms by Home Centre. Home Centre, a leading home retailer in the Middle East, is launching a complete range of distinctive furniture and home accessories in the ‘Living’ and ‘Sleeping’ categories to allow customers a wide choice for their interiors – all at reasonable prices. 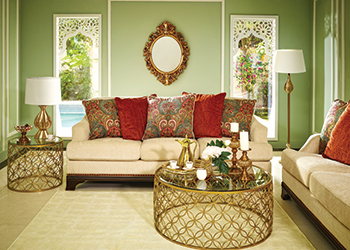 “With a palette of more than 300 new living room styles, the Living showcase will enable customers to rejuvenate their homes with a selection of eclectic furniture and accessories, to create designer spaces that integrate high quality products at competitive prices,” says a spokesman for the retailer. The showcase will highlight a signature sofa, amongst a range of new furniture. This contemporary modular sofa, which enables limitless furniture combinations, will be available in nine distinctive colours, making it a versatile choice for any living space. The Sleeping showcase, on the other hand, will pay tribute to the significance of bedrooms in relieving the stress of a long day. “The day starts and ends in the bedroom, and this showcase is all about enabling customers to personalise their bedrooms with all the elements of comfort needed to help them relax, rejuvenate and create a soothing space for themselves at home,” the spokesman says.